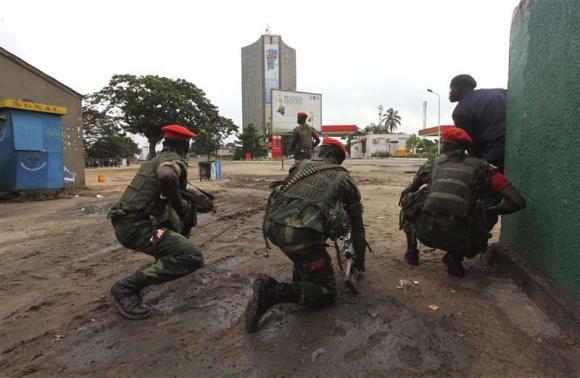 Congolese security officers position themselves as they secure the street near the state television headquarters (C) in the capital Kinshasa, December 30, 2013. A self-proclaimed Congolese ‘prophet’ said on Tuesday an uprising by his supporters in Kinshasa was prompted by an army assault on his residence after he criticized President Joseph Kabila, something the government denied. Armed youths tried to seize the airport, a military barracks and the state television headquarters in the capital of the Democratic Republic of Congo on Monday before being repulsed by troops, in clashes the government said killed 103 people, including 8 soldiers. Paul Joseph Mukungubila, who calls himself ‘the prophet of the Eternal’ and who ran unsuccessfully for president in 2006, said the attacks were a spontaneous response by his followers to an army assault on his home in the eastern mining town of Lubumbashi. “I have lost a lot of brothers … I cannot understand what happened,” Mukungubila told Radio France Internationale, insisting his followers were not carrying arms. “They came with their hands empty … I am a man of peace,” he said. Mukungubila’s ‘Ministry for the Restoration starting from Black Africa’ said in a statement published on its Facebook page that Congolese soldiers attacked his residence early on Monday after he published an open letter saying Kabila was a foreigner and should not remain in power. Government spokesman Lambert Mende strongly denied Mukungubila’s version of events, saying the assailants in Kinshasa were armed with guns and grenades and had launched an unprompted attack on government institutions. Mende said soldiers went to the pastor’s residence in Lubumbashi after he was implicated in the Kinshasa incidents. Kinshasa’s Njili international airport had reopened to national and international flights, though 10 planes which were on the runway at the time of the shooting were undergoing a 48-hour check, Mende said. Mukungubila has railed against Kabila’s decision to make peace with Tutsi rebels in eastern Congo, saying the president was bowing to pressure from Rwanda. Like many of Kabila’s critics, Mukungubila brands the president a Rwandan – a sign of the deep resentment felt by many, particularly in the western capital Kinshasa, to having an eastern-born, foreign-educated leader. The statement from Mukungubila’s office said his followers in the towns of Kindu and Kisangani had also risen up to attack government positions. Before transmission was shut down at the state television on Monday the attackers shouted slogans in favor of Mukungubila and against Kabila. Political tension has risen amid speculation that Kabila, who took power in the vast, mineral-rich African nation in 2001 after the assassination of his father, may try to change the constitution and run for a third term in 2016 against a fragmented opposition.